Today was such a beautiful day that I couldn’t resist a wander through Logie House Garden. So much has changed in the past couple of weeks. The expanse of the garden in many places is now obscured by leaves and petals which have appeared as if by magic, framing pathways and creating new vistas. There’s a riot of purple at the moment, the tulips are nearly over, but there are alliums, peonies and lupins aplenty, as well as trees tinged with pinkish blossom. I stumbled upon Panny, the real gardener, who took me on a wander with her. Panny told me that the story goes that James Cook and his crew were mapping up the West coast of America. As they were passing a group of islands in British Columbia, he went past this particular island and shouted to ask what the island was called. The local people shouted back something that Cook and his crew took to be, ‘nootka nootka’, so he thought ‘thank you very much’ – but what they actually meant was ‘turn your ship around because you’re going to go aground’. So the plant from this island is called nootkatensis after the island that never had that name at all. Whether that’s strictly the true story of how this lupin acquired its name, I can’t seem to find out, but there’s something in it and it’s more interesting than discovering it means ‘purple and pointy’ or something in Latin. 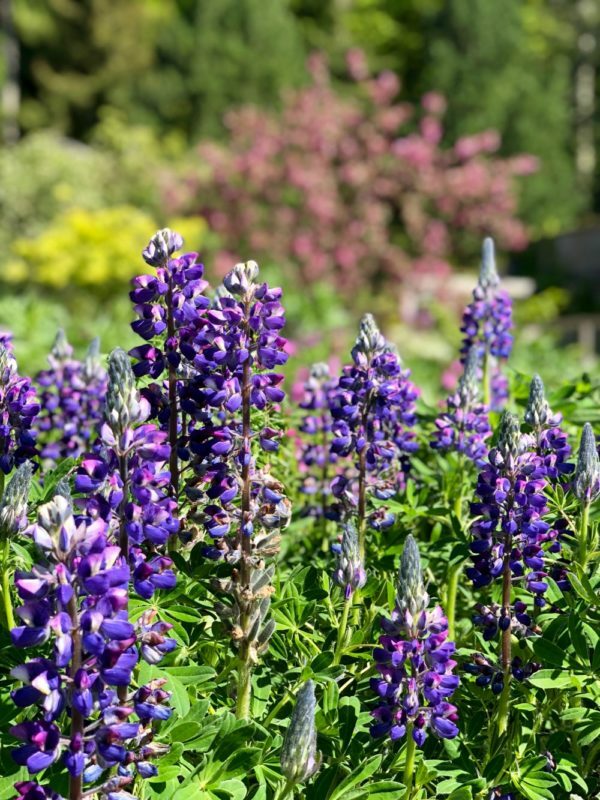 After seeing these lovely Lupins in full flower in the garden, Panny took me into the nursery to see the stages that come before – how the seed from those very flowers will create more and the different stages from there to here. Her enthusiasm is infectious and if you’re a gardener yourself you’ll be able to tell whether I listened well enough to my lesson; this time I didn’t send my homework to the gardner before I hit ‘Publish’!.. Because the Lupinus nootkatensis is not a variety (that a person has bred) but is a species, it breeds true from seed. 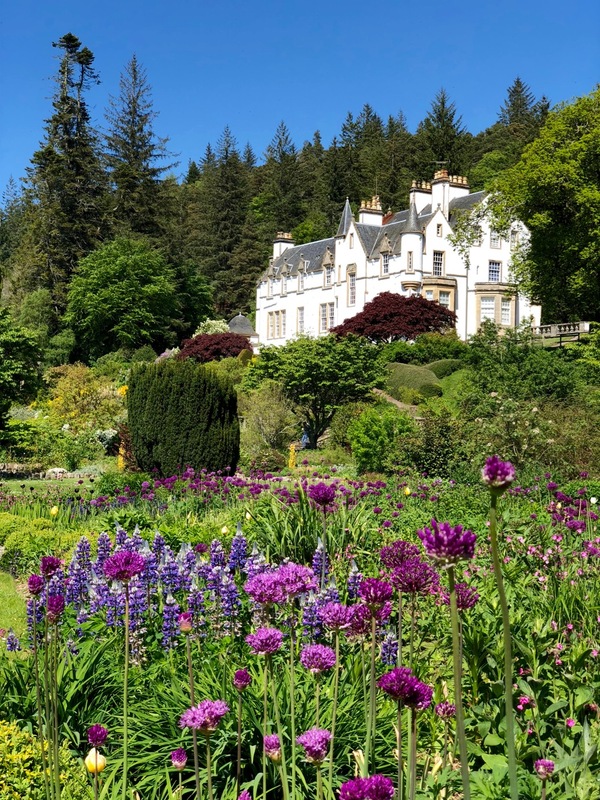 To end up with the gorgeous blooms in shades of purple you see growing in the garden right now (and at the top of this page), seeds are collected in early autumn from Logie House Garden. Fresh seeds are put into a pot with gravel on the top, about 20ish seeds in a pot. These ones in the picture below were sown in November so that they then have a cold spell and come up in the spring. The plants will ‘know’ to germinate when the conditions are right. Gravel on top keeps the pot clean and keeps moisture in and it sits outside all winter long. The first leaves are very thick and tough compared to the true leaves – they can and do withstand some serious weather. These leaves then disappear like baby teeth and are replaced by the true leaves. 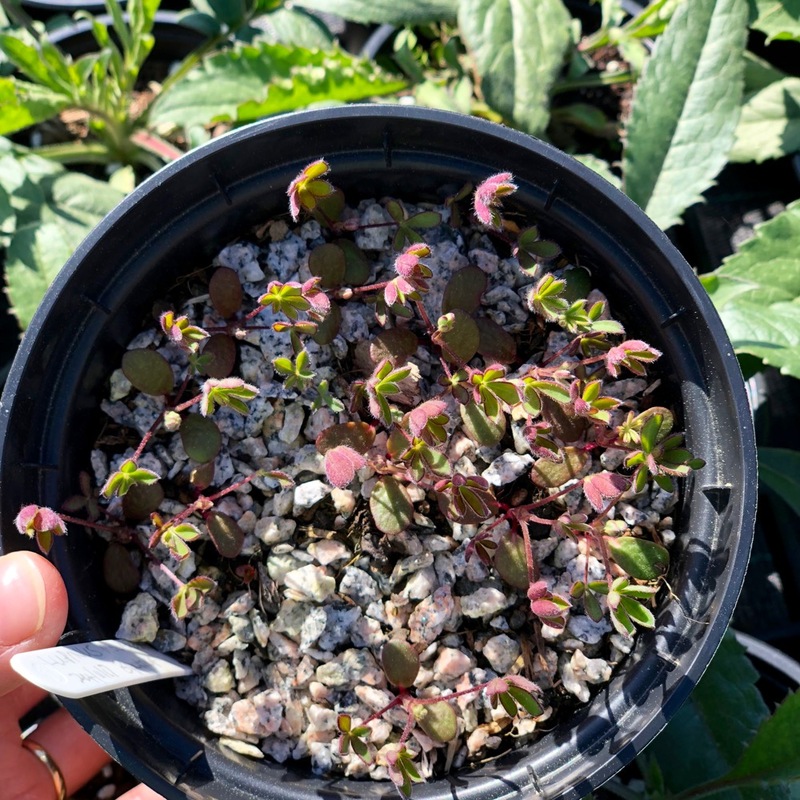 The undersides of the true leaves at this new growth stage have a reddish tinge (see picture below), which is nature’s warning to animals to suggest that they might be poisonous. Once the plant is bigger and stronger this red colour gives way to green. Panny tells me that red/dark purple on the underside of the leaves of a mature plant has a different purpose and suggests that it likes to live in shade as the red will stop whatever light there is from travelling straight through the leaf and will absorb as much of it as possible. Once the plants have true leaves (not just the dicots/first leaves) they are then pricked out individually into small pots to grow on. They grow on in this pot for a couple of months. Some of the plants in the pots at this stage self-seeded in the garden and were dug up at this point rather than grown right from collected seed – nature did the first part of the job for the gardener. Both types started off life in Logie House Garden. The little plants overwinter in a slightly larger pot outside with a frame and mesh around to protect from the voles who find it delicious. 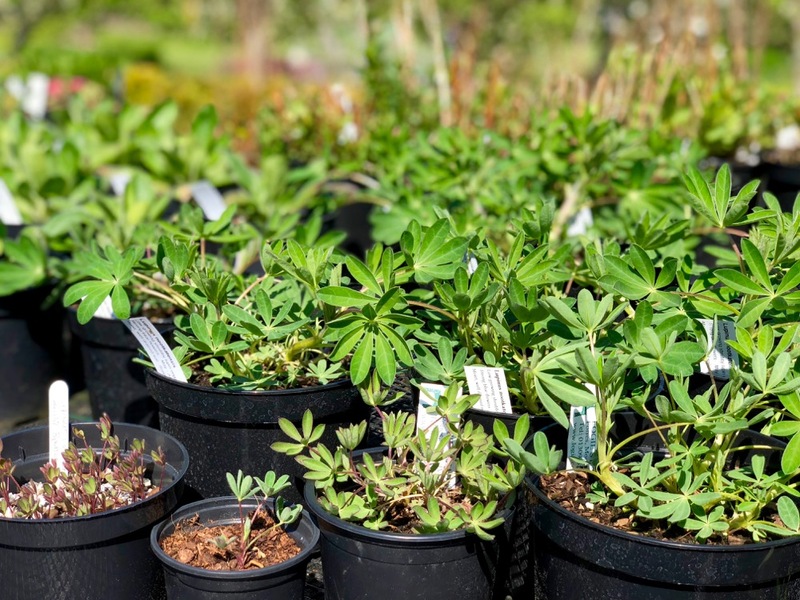 As soon as they start growing in late spring they’re potted into a larger pot, where they grow on until large and strong enough to go to the shop and are ready to be planted in your garden.  These four stages can be seen from left to right in the picture below. These, when planted in your garden now, will flower this year. Lupinus nootkatensis is a hardy perennial and will die down over the winter and come back the following year, most likely bigger and stronger than this. Chop the dead bits off and that’s all the maintenance required – a nice easy plant to grow and look pretty in your garden. My type of flower! I think i’ll be nipping over to Logie Farm and Garden Shop and taking some home for my own garden. And if you’re wondering if it will be hardy enough for where you live, Panny says that she’s seen it growing along the A9 up on the hill on the left at the north end of the long bit of dual carriage way just into Perthshire – when you’ve just gone over the top. If it can survive there it’s certainly hardy enough for most gardens in Scotland! As we wandered through the garden pondering the Lupins, we saw clumps of Pink Campion dotted about the beds. Having grown up in Cornwall surrounded by the deep lane-side banks we call hedges, I was pleased to be able to name it (not a great feat you might think, but that’s the level of my gardening expertise) and wondered why this pretty hedgerow weed was being allowed to grow in the garden. Before I could ask, Panny was distracted by a particularly effusive clump and stopped to admire it. She said, ‘People new to working in the garden always want to pull it out but I like it, so we keep it. 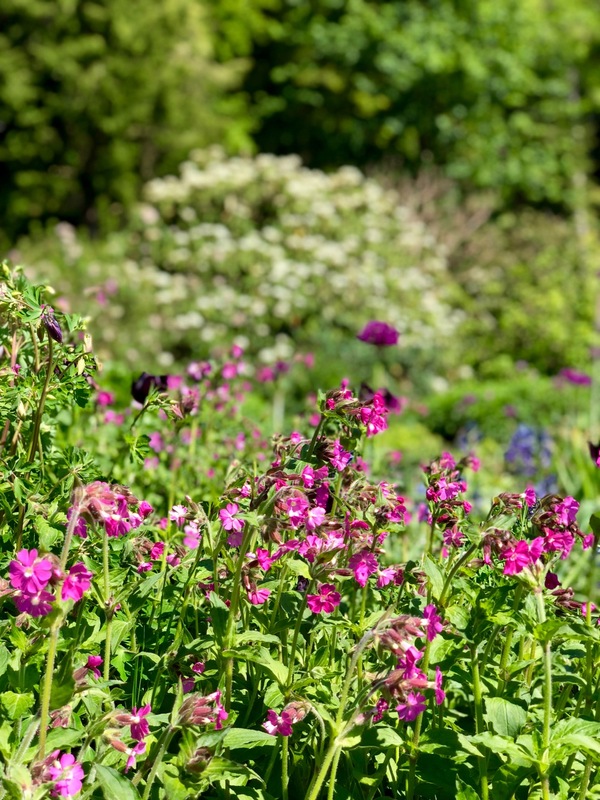 It’s better than bare earth, and it can be dug up at any time if you don’t want it any more or want to plant something else.’ Seems good enough reason to me – it looks very pretty and ‘wild’ and there are plenty enough weeds that aren’t pretty to pull out. Plus, as Panny pointed out, it’s a source of nectar for bees – another reason why it’s better than bare earth at least! And a note to a real novice like me that, if you like something in your garden, who is anyone else to tell you that it’s a weed. I’ll admire the profusion of Campion covering up the less attractive weeds in my own garden all the more.